From souvenirs and oddities to artisan craft and Greek pastries, this buzzing flea market is a great place to experience the local culture. Head to the Monastiraki Flea Markets to discover a buzzing hive of stalls and vendors overflowing with knick-knacks, souvenirs, antiques and oddities. Visit these markets any weekday during regular business hours for conventional store souvenirs, or experience the flea markets on weekends, especially Sundays. Small stalls open up in place of the bigger stores, and carpets roll out, filled with all kinds of cheap trinkets and gems. Locals sell their wares in seemingly endless rows of shops spanning from Monastiraki Square across to Platia Avissinias, from Ermou Street down to Adrianou Street. Mass-produced items, such as hats, T-shirts and prints of religious icons, are displayed alongside unique artisan musical instruments, paintings by monks from Mount Athos and handmade Greek sandals. Monastiraki holds many rewards for those hunting bargain souvenirs or rare items. The flea market stalls usually close in the early afternoon, so start your hunt before midday. Mid-morning is the best time to avoid the crowds and the summer heat. Stop by one of the many cafés and bars lining the streets to refresh yourself with a cold drink and some Greek pastries. If you are visiting a little later in the day, try an ouzo, an aniseed liquor. It goes well with mezedes, a selection of small dishes. Reach the Monastiraki Flea Markets using Athens’ affordable public transportation network. Local buses and the metro train system serve the area regularly. The outer edge of the markets is located next to the central Monastiraki train station. This is right in the heart of ancient Athens, just north of the Acropolis. Be aware of pickpockets in the area and keep your valuables close when sitting in cafés. With a little care, though, these markets are a lively and colorful place to spend a few hours. Want to discover this famous attraction is an unique and memorable way? Then you can't go past a Private Session with a Local Photographer in Athens. For even more things to do, examine our Athens things to do page. Step back in time and explore the ancient myths etched into the walls of the largest Doric temple in Greece, originally dedicated to the warrior goddess Athena. Explore a smorgasbord of artifacts and artwork,from all of the important Greek eras, in this exquisitely restored mansion. This magnificent sundial and weather vane features marble sculptures of the eight wind deities and was one of the first clock towers in history. Admire views over the Ancient Agora from this hill, the site where ancient murder trials were staged and where, according to the Bible, St. Paul preached. In the ruins of this monument to knowledge, see the notches in marble where papyrus book rolls were once stored. 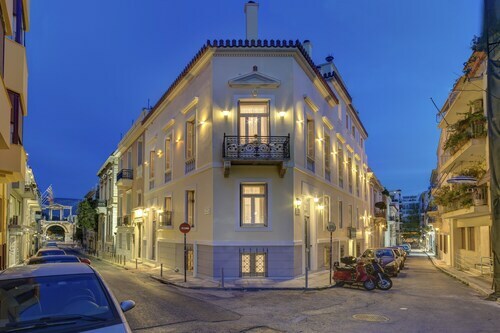 Located in the historic heart of Athens, this boutique hotel is a 3-minute walk from Ancient Agora and a 10-minute walk from the Acropolis and Parthenon. The metro station is a 2-minute walk. 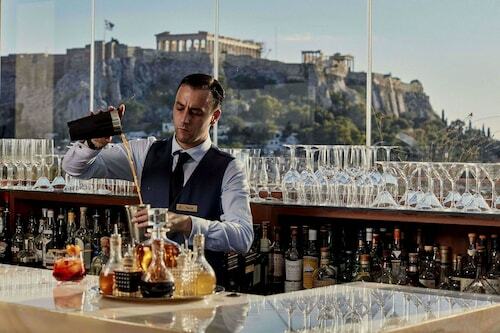 This family-friendly Athens hotel is located in the historical district, within a 15-minute walk of Hellenic Parliament and Acropolis Museum. Monastiraki Station is only a 3-minute walk and Thissio Station is 9 minutes. Located in Athens City Centre, this hotel is within a 10-minute walk of Greek Evangelical Church, Acropolis Museum, and Parthenon. Hellenic Parliament and Benaki Museum are also within 1 mi (2 km). Akropoli Station is only a 3-minute walk and Leoforos Vouliagmenis Station is 7 minutes. 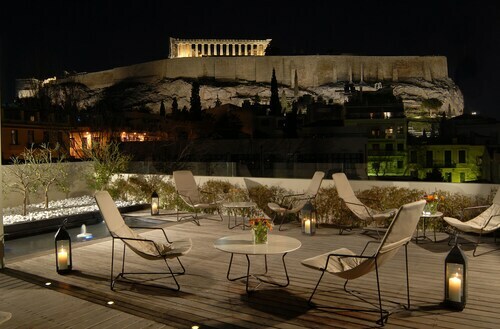 This hotel overlooks the ancient Acropolis, and just steps to Acropolis Museum. Located near many of Athens' ancient sites, including Herod Atticus Theatre, Plaka old quarter, and only a 15-minute walk to Syntagma Square. Located in Athens City Centre, this luxury hotel is within a 15-minute walk of Ermou Street and Omonia Square. National Archaeological Museum of Athens and Hellenic Parliament are also within 1 mi (2 km). Metaxourghio Station and Metaxourgio Station are within a 2-minute walk.